On Sunday, Shakhtar claimed a win in Dnipro, retaining the eight-point lead above Dynamo. Almost immediately the Pitmen switched to the Ukrainian Cup performance: the game against Poltava will take place in two days on the third one and will start pretty early – at 13:00. It is quite likely that Paulo Fonseca will make certain changes in the starting line-up, and a number of players who did not take part in the encounter with Dnipro, will appear on the pitch of Lokomotiv stadium. Shakhtar made it past Oleksandriya in the Ukrainian Cup Round of 16. The match took place a month ago and ended 2-1 in favour of the current title holders. Stepanenko and Marlos got their names on the scoresheet for the Pitmen. Poltava beat Karpaty at home with the same score (with Kovtun and Troyanovskyi scoring). We want to remind you that both in the current season and at every Cup stage, teams play only one game. The Cup meeting with Shakhtar will be Poltava’s closing game this calendar year. The charges of Yuriy Yaroshenko played their most recent game on November 19, claiming a 3-1 win over Sumy. Thus Poltava interrupted their unfortunate run of three November defeats featuring no goals scored, over which the team dropped significantly in the table. Poltava will leave for the winter break in the 11th spot. As part of preparation for the meeting with the Pitmen, the opponents had a friendly against Akhtyrka-based Neftianyk: enjoying a 2-0 lead (with Voronchenko and Ivanov scoring), Poltava conceded two goals in the second half. 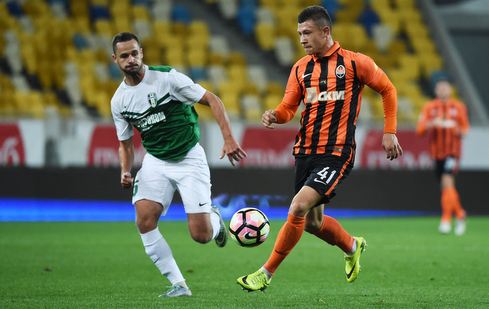 Shakhtar and Poltava thrice locked horns in the Ukrainian Cup. All the meetings ended in the wins by the Pitmen, with an aggregate goal difference of 11-2. In the 2014/15 season, they played two legs within the Round of 16 stage. The first one in Poltava ended in the Pitmen’s convincing 5-1 win. The return leg was held at Bannikov UTC on October 27, 2014. Even before the break, the goals by Nem, Gladkyy and a brace by Bernard removed absolutely all questions about the winners, with Korkishko netting a consolation goal in the second half to make it 4-1. Shakhtar are ten-time Ukrainian Cup winners.